Attractive in appearance and sleek in design, up and over garage doors come in a range of customisable colours and textures to suit any style of property. As a leading stockist of the Hormann Series 2000, here at Zap Garage Doors we offer a comprehensive range of sizes – in either canopy or retractable gear – to fit to a timber frame. For a seamless, uniform look, we recommend that the Hormann powder coated steel frame is used as it makes a complete door set. 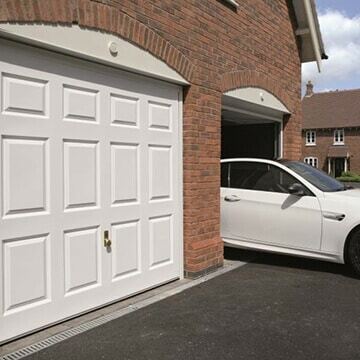 Available in both single and double sizes, our up and over garage doors can be fitted to any size of garage. 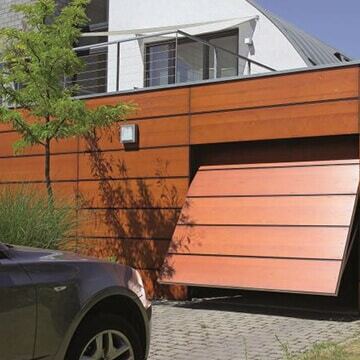 The retractable gearing mechanism makes for a quick, long-lasting installation, and comes in plus sizes to create a wider passage for your car if required. To increase security and convenience, high tech solutions are also available, including fingerprint recognition and radio opening options. Visit one of our showrooms in Doncaster, Sheffield or Wakefield to see the full collection, or book a free home visit and we’ll discuss your requirements on a more personal basis. Simply get in touch with our friendly team today.